The 2019 Legislative Session came to an end last night at 12:00 a.m. GMA achieved a number of legislative victories this year and would like to thank city officials for their engagement in the legislative process. Your calls, emails, and texts to your House and Senate members makes a difference when GMA staff is at the Capitol advocating on your behalf. GMA staff would like to express appreciation to Chairman Phil Best and all the members of the GMA Legislative Policy Council for advising on legislation as well as advocating for cities during the session. City officials are encouraged to contact Governor Kemp on any local legislation which passed that affects their city. A number of revenue and finance bills passed the House and Senate during the session and have been sent to Governor Kemp. GMA encourages city officials to contact Governor Kemp and ask that he sign these important bills into law. HB 182, Online Sales: Lower Threshold for Collection of Sales Tax, by Rep. Brett Harrell (R-Snellville), would lower the threshold for a retailer to collect sales taxes on online purchases from $250,000 or more in gross yearly sales to $100,000 or more. It is estimated that HB 182 would bring in $37.8 million in local revenue in the next five years. GMA supports this bill. HB 379, SPLOST Reporting Date Flexibility, by Rep. Beth Moore (D-Peachtree Corners), would change the publication date for local governments reporting SPLOST activity in the local newspaper to 180 days after the end of a fiscal year. GMA supports this bill. HB 456, Raising the Expenditure Cap for AUPs, by Rep. Jan Tankersley (R-Brooklet), would allow more cities to utilize agreed upon procedures (AUP) instead of an annual audit. Currently, local governments that are either under 1,500 in population or have $300,000 or less in annual expenditures can use an AUP. This bill would raise the expenditure cap from $300,000 to $550,000. It is estimated that HB 456 will give 125 cities additional flexibility in regards to their annual audit. GMA supports this bill. SB 157, Reciprocal Deposits, by Rep. John Kennedy (R-Macon), would allow local governments to use banking services that ensure that 100% of their deposits are FDIC insured. GMA supports this bill. A big win this year for Georgia's local governments was the defeat of the House and Senate bills that would have prohibited local governments from adopting design standards for residential homes. These bills would have taken away the right of citizens to decide the look and feel of their communities. HB 302, Preemption of Local Building Design Standards, by Rep. Vance Smith (R-Pine Mountain), and SB 172, Preemption of Local Building Design Standards, by Sen. John Wilkinson (R-Toccoa), both failed to pass out of their respective chamber by Day 28, Crossover Day, the last day a bill could pass one chamber and be eligible for consideration by the other. The participation of city officials was key to the defeat of these bills. GMA would like to thank all the cities that passed resolutions in opposition to HB 302 and SB 172 and to all the city officials who contacted their House and Senates members, expressing concern about the preemption of local decision making. Your participation in the legislative process is important and the collective voice of city officials makes a difference. Bills aimed at leveling the playing field between local brick and mortar small businesses and online retailers failed to pass on the last day of the 2019 Legislative Session. HB 276, Sales Taxes: Marketplace Facilitators, by Rep. Brett Harrell (R-Snellville), and SB 128, Marketplace Facilitators, by Sen. Chuck Hufstetler (R-Rome), would have helped Georgia's tax code keep pace with the online economy by requiring the collection of sales taxes on online platforms that facilitate retail sales, deliveries, and/or services for third parties. The fiscal note on the original version of this bill estimates that local governments would see an increase in revenue of $63 to $71 million in FY2020 and $73 to $83 million in FY2024. GMA would like to thank city officials for the efforts they made in contacting their House and Senate members in support of GMA's and other's efforts to get these bills passed this year. GMA will continue to advocate that online businesses should be subject to the same tax laws as local brick and mortar businesses. 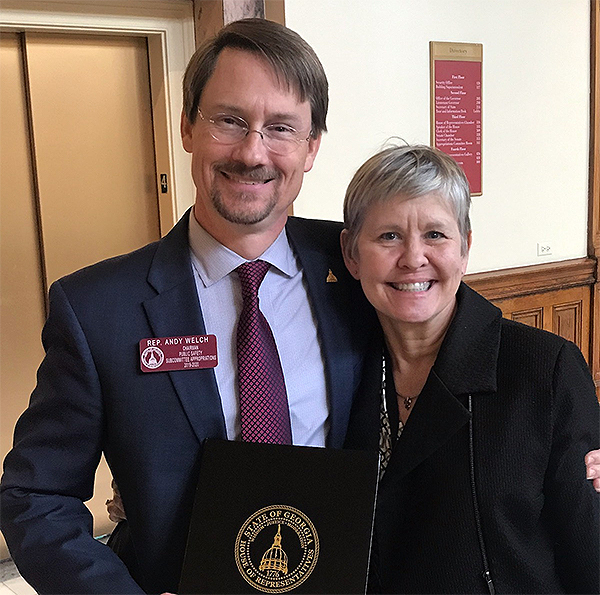 GMA General Counsel Susan Moore was honored by the Georgia House of Representatives on Tuesday, April 2, in recognition of her 25 years of service to GMA. Moore is retiring from GMA at the end of April. She's pictured with Rep. Andy Welch (R-McDonough), himself a city attorney, who was the lead author of the House resolution honoring Moore. The following bills have passed both chambers and have been sent to Gov. Kemp for his signature. HB 220, Solid Waste & Hazardous Waste Trust Funds Sunset Extension, by Rep. Terry Rogers (R-Clarkesville), would reauthorize the solid waste and hazardous waste trust funds for the next three years with a new sunset date of July 1, 2022. GMA supports this bill. HB 242, Regulation of Massage Therapy Establishments, by Rep. Lee Hawkins (R-Gainesville), would retain certain local control protections on massage therapy businesses. GMA is neutral on this bill. HB 322, Procurement Registry, by Rep. Tom McCall (R-Elberton), would raise the threshold requirement from $10,000 to $100,000 before a city would be required to advertise any bid or proposal opportunity on the Georgia Procurement Registry. GMA supports this bill. HB 346, Retaliation Against Tenants Reporting Code Violations, by Rep. Sharon Cooper (R-Marietta), would prohibit retaliation by a landlord when a tenant reports code violations to a government, reports utility problems, or joins a tenant organization. This bill also includes protections to landlords from retaliation claims in specific circumstances. 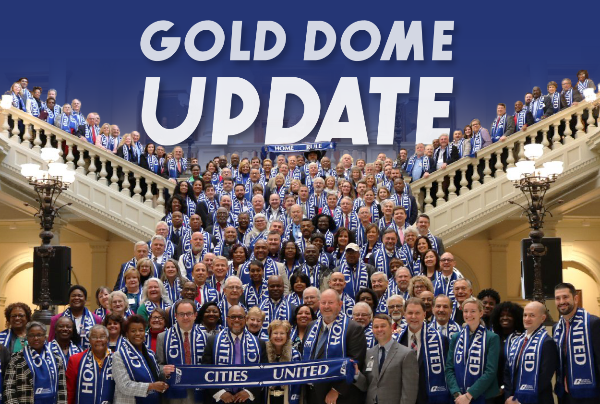 HB 346 would help ensure adequate living conditions by providing cities with the information they need to enforce local health, public safety, and building and housing codes. GMA supports this bill. HB 454, Electric Assisted Bikes, by Rep. Kevin Tanner (R-Dawsonville), would establish three different classes of electric assisted bicycles and includes rules for their use and safety. GMA supports this bill. HB 493, Private Permitting Review and Inspection Act, by Rep. Kevin Tanner (R-Dawsonville), would allow applicants for construction or building permits to retain a private professional for plan review and inspection at their own expense if the local government determines it does not have the staffing capacity to complete the regulatory action within 30 days. The applicant would be required to pay 50% of the local government’s permit fee. This bill would also allow an applicant to hire a private plan reviewer even if the local government indicates it can process the permit application within 30 days, but the full cost of the local government’s permit fee would apply. Keeps the granting of a certificate of occupancy with the local government. GMA is neutral on this bill. SB 2, EMCs & Broadband Delivery Sen. Steve Gooch (R-Dahlonega), would authorize electric membership cooperatives (EMCs) to provide broadband services. GMA supports this bill. SB 66, 5G Technology: Streamlining Wireless Facilities and Antennas Act, by Rep. Steve Gooch (R-Dahlonega), would allow local governments to maintain control and discretion over the most crucial stages of small cell wireless deployment. The framework for SB 66 is rooted in the principle of encouraging small cell wireless deployment through the co-location of new equipment on already-existing infrastructure. Co-location is cost-effective for the providers, is the least invasive option in regards to the public right-of-way, and is less costly for cities and counties to regulate and maintain. Requires that local aesthetic and decorative pole conditions be met. SB 95, Municipal Utility Contracting, by Sen. Randy Robertson (R-Cataula), would extend from 10 years to 20 years the length of contracts local governments may enter into for solar or wind utility projects. GMA supports this bill. The following bills did not pass during the 2019 Legislative Session. HB 76, Alcoholic Beverages Distance Requirements, by Rep. Ron Stephens (R-Savannah), would allow cities and counties to adopt less restrictive distance requirements for pouring and package sales than those set forth in state law. GMA supports this bill. HB 243, Linear Fees for Fiber in the Rights-of-Way, by Rep. Lee Hawkins (R-Gainesville), would reduce the amount of compensation telecom companies pay for usage of the public right-of-way when laying fiber optic cables and connecting to small cell wireless antennas. Currently, cities charge the same rate per linear mile as DOT which is $5,000 in urban areas and $1,000 in rural areas if there no retail customers in the jurisdiction. HB 243 would reduce right-of-way fees owed to local governments for non-retail service providers but allow DOT to continue to assess the higher rates. GMA opposes this bill. HB 365, TAVT Rate Reduction, by Rep. Shaw Blackmon (R-Bonaire), was originally written to reduce the title ad valorem tax (TAVT) rate from 7% to 6.6% while taxing used cars at the same rate as new cars. It was amended by the Senate at the end of the legislative session to provide a special sales tax exemption to ride share companies and would have imposed a 50¢ per ride fee. The bill then got caught up in a back-and-forth between the House and Senate and never reached a final agreement between both chambers. GMA opposes this bill as amended by the Senate. HB 411, Prohibition of Fees on the Property Tax Bill, by Rep. Brett Harrell (R-Snellville), would prohibit local governments from placing fees or assessments on property tax bills. This bill would, however, allow fee and assessment bills to be included in the same mailing with property tax bills. GMA is working with the author on this bill. HB 428, Communication Services Tax, by Rep. Bill Werkheiser (R-Glennville), would create a 2% state and a 2% local excise tax on communication services with an additional 2% on satellite services that would be paid to the state only. This bill would repeal local franchise fees, ROW fees, cell tower fees, occupational taxes, and other sales taxes on communications services and combine them into one communication services tax (CST). GMA is working with the author on this bill. HB 465, Water Customer Bill of Rights, by Rep. Don Parsons (R-Marietta), would place significant mandates on the everyday business operations of water providers. GMA opposes this bill. HB 469, Booting of Motor Vehicles, by Rep. Matt Dollar (R-Marietta), would explicitly make it illegal to use a vehicle boot unless authorized to do so by a city or county. HB 469 also outlines the parameters on the practice of booting if allowed by a local jurisdiction. GMA supports this bill. 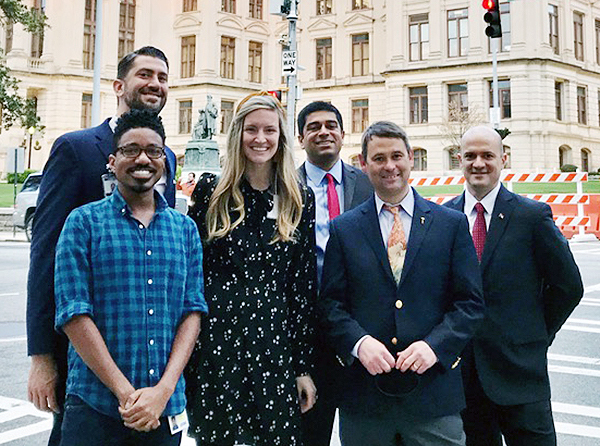 HB 511, Creation of the Department of Mobility and Innovation, by Kevin Tanner (R-Dawsonville), would create a new Department of Mobility and Innovation to plan and implement transit across the state. GMA supports this bill. HB 523, Short Term Vacation Rental Regulation Preemption, by Rep. Kasey Carpenter (R-Dalton), is pending in the House Regulated Industries Committee. This bill would prohibit cities and counties from 1) imposing occupancy limits, restricting the use of, or regulating the duration of a short-term rental property; 2) requiring the inspection, licensing, or registration of short-term rental property; and 3) requiring the licensing or registration of owners or operators of short-term rental property. GMA opposes this bill. SB 131, State Airport Overview Committee & Department of Mobility and Innovation, by Sen. Burt Jones (R-Jackson), create a state airport overview committee to review the operations of all commercial airports in the state. This bill now also contains the language in House Bill 511 which would create a new Department of Mobility and Innovation to plan and implement transit across the state. GMA is evaluating SB 131 as currently written and is on record in support of HB 511. SB 146, Retail Package Store Tastings, by Sen. Frank Ginn (R-Danielsville), would create rules for beer, wine and distilled spirits tasting events at licensed retail package stores, and would allow cities and counties to impose additional terms, conditions, and limitations upon the party hosting the tasting. This bill would also allow local governments that have passed Sunday sales laws the authority to move sales hours to 11:00 a.m. by ordinance rather than the requirement of holding another referendum. GMA supports this bill. SB 222, Misdemeanor Citation Form & Criminal Justice Reform Council, by Sen. Jesse Stone (R-Waynesboro), would allow law enforcement to use either the uniform traffic citation form or uniform misdemeanor form when writing tickets for misdemeanor or local ordinance offenses, and would allow law enforcement to identify persons through means other than fingerprinting. SB 222 also would reestablish the Georgia Council on Criminal Justice Reform. GMA supports this bill. GMA's governmental relations team says "Thank You!" to all the city officials who helped us have a successful 2019 Legislative Session! Copyright © 2019 Georgia Municipal Association, All rights reserved.